Key dealers nabbed and 289 kilos of ivory seized – Kenyatta University TV (KUTV). All Rights Reserved. 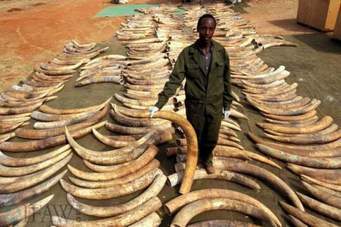 Security agencies have arrested ten suspects and seized more than 200 kilos of ivory and 96 kilos of pangolin scales in a joint operation targeting wildlife trophy dealers and known poachers. The suspects have featured in the Kenya Wildlife Services list of wanted persons. Also seized were several kilos of rhino. The ivory was all headed for Asia where there was ready market. All the suspects are facing charges in courts. KWS has identified an emerging trend in the trafficking of pangolin scales sourced from Central African Republic and smuggled to the far-East through Kenya. According to KWS, the Pangolin is the world’s most trafficked mammal, increasingly hunted for its meat and scales in some Asian countries. The latest arrest was on June 27 when six men were arrested after they were found with 216 kilograms of ivory valued at about Sh21 million in a house in Utawala area, Nairobi. Those caught with the tusks told police they were headed for Hong Kong where the owners had paid for their shipment. Among those nabbed is Abdinur Ibrahim Ali, a businessman based in Moyale. Police investigations show he works with Guinean nationals based in Uganda as well as Chinese buyers abroad. The ivory he was found with in Utawala Estate had been sourced from the Democratic Republic of Congo, police investigations show. Another suspect identified as Ahmed Mohamud Salah alias Ahmed Mahabub Gedi, who is a Somali national with fraudulently acquired Kenyan documents. He is reported to be the link person between Kenyan ivory traders and the far eastern markets of China and Thailand. He was arrested by police at the Kenya-Namanga border on Saturday July 1, 2017 as he attempted to flee the country. The KWS also singled out two notorious rhino poachers who have repeatedly sneaked into conservancies in the Mountain Conservation Area (MCA), to harvest rhino horns. The two were named as Gichobi Mwai and Gerald Nderitu and were arrested following the killing of a rhino at Solio ranch on May 29, 2017. They were found in possession of an illegally acquired rifle which was linked to the poached rhino. Intelligence sources allude to emerging links between Kenyan ivory dealers and Chinese nationals currently operating in the country using dubious work permits. Rampant corruption practiced by airline staff working for cargo airlines continues to hamper the war against wildlife trophy trade. The arrest comes at a time when various agencies are investigating the March 2017 seizure of ivory weighing 117 kgs in Hanoi, Vietnam. The Hanoi seizure was later traced back to Jomo Kenyatta International Airport.